Martin The Journal of Acoustic Guitars is a glossy magazine published by CF Martin Guitars every 6 months. The latest edition (Vol. 7, p. 64 – 69) contains a great article about what CF Martin are doing about promoting sustainable tonewoods. CF Martin has a problem, a problem called success. Most of the world’s premium guitars are built from a combination of mahogany, rosewood, and ebony. However, these traditional tonewoods often come from areas of the world that are under severe pressure from logging and development. “We’ve done such a good job of convincing the customer that these traditional, rare and exotic timbers make the best guitars, that it’s difficult to move customers away from those materials,” said CEO Chris Martin. Being an old company can have its advantages and its disadvantages. In the case of CF Martin tradition and heritage can prevent change, even if that change is desperately needed. And in the international tonewood market change is definitely needed; change away from using rainforest and old growth timbers to a more sustainable future. The customers of CF Martin are becoming a problem. They are addicted to rosewood, mahogany and ebony! So Martin Guitars approach to sustainable tonewoods is to establish a close working relationship with a third party forest certifier, in this case the Rainforest Alliance and the Forest Stewardship Council (FSC). Hence the Rainforest Alliance has created the Follow the Frog program, which Martin Guitars has signed up to support. In the mean time Martin Guitars are caught between an inflexible customer base and a rapidly changing tonewood market. In the coming years, Martin will introduce a new line of guitars using temperate hardwoods from North America that relies on both historical and new shapes and designs. Can the FSC logo be displayed on the front page of the Martin website? Under the “Guitars” section of the website, why can’t I select and view FSC guitars? Even when I find an FSC guitar using the Search facility, the FSC logo isn’t prominently displayed. And if I go to this page under Custom Shop (https://www.martinguitar.com/custom-shop/tonewoods/) the message is all about rare and exotic tonewoods. Nothing about a sustainable future at all. So whilst the commitment to sustainable tonewoods is there I think the marketing and promotion at CF Martin still needs extra work, whilst at the same time the focus on traditional, rare and exotic timbers needs to be ramped down. I wish CF Martin all the luck in the world in their endeavours to change the acoustic guitar market. My apologies for such a long blog but the ongoing fiasco of Tasmanian State forest policy and practice continues to dominate the commercial and political landscape. I wish it were different! As part of the application process for Forest Stewardship Council (FSC) certification Forestry Tasmania recently released a summary of issues raised by stakeholders and Forestry Tasmania’s responses to these issues. These two reports are available from their website. As usual my comments relate to Forestry Tasmania’s commercial management and performance, as well as to special timber issues. These are discussed in the report Forest Management Plan – Public Summary of Stakeholder Submissions and Responses (103kb PDF). The first thing that is immediately obvious in the response documents is the ongoing absence of any serious discussion around commercial management and performance. There is not even a section in the document with the heading Commercial Management and Performance. I find this utterly extraordinary. Actually I find it quite offensive!! At a time when Tasmania faces a budgetary crisis and we are sacking teachers and nurses and dropping other essential public services, we continue to subsidise Forestry Tasmania. A Government Business Enterprise wasting scarce taxpayer’s money getting native forest products to market! This is apparently more important than our children’s education or the health of the community! It also says a lot about the lack of corporate governance by the State Government and the State Parliament. Clearly FT does not regard taxpayers as important stakeholders. Also not enough Tasmanian taxpayers are visiting their local FT offices and complaining about this ongoing waste! Common people! Get to it!! A common comment was that insufficient consideration was given to production and economic considerations. Some stakeholders were concerned that there was an over emphasis on environmental and social considerations compared to economic considerations in the draft plan. Some stakeholders commented that Forestry Tasmania needs to be financially self sufficient and return a profit to its shareholders. Positive financial outcomes are one of six strategic objectives now identified in the released Plan. Forestry Tasmania will implement the systems and strategies outlined in the Plan to meet the other five objectives, while also seeking to meet the objective of achieving positive financial outcomes. Forestry Tasmania’s Ministerial Charter details the activities that the Government expects us to undertake. In addition, Forestry Tasmania also produces a Statement of Corporate Intent, which is available on our website and describes the organisation’s financial performance targets as agreed by its Board and shareholder Ministers. They provide little information on how FT is going to improve its commercial management and performance. I would think that given the ongoing State budget crisis and need for taxpayer support, that these matters would form a major part of the Forest Management Plan. Instead the FMP ignores these important issues. Clearly the stakeholder concerns expressed above are in fact correct and have yet to be dealt with. Forestry Tasmania continues with the charade that wood production is not a profit-driven, commercial business. Curious really. All private tree growers against which Forestry Tasmania competes in the marketplace, certainly regard wood production as a profit-driven, commercial business. At least there is a section in the document dealing specifically with special timbers (page 5). Not surprising given that this issue has dominated much State parliament discussion. o Suggestions that the Permanent Timber Production Zone land would not be able to sustainably supply industry needs. Haven’t we known this for decades? Despite all the gloss, spin and promises the supply of special timbers has never been on a sustainable basis. o Suggestions that current harvesting practices are leading to poor recovery and waste of special species timber. The inevitable result of poor commercial management and an industrial forestry business model. Again no surprises. o Requests for a detailed inventory of special species. Such an inventory would cost more than the resource is actually worth. Which is why FT has never done one. Forestry Tasmania acknowledges the concerns stakeholders have about special species supplies. The Plan has been updated to detail how recent legislative changes affect the special species timbers supply from Permanent Timber Production Zone land. These changes have reduced the area of the Special Timbers Zone managed by Forestry Tasmania from 97 000 to 56 000 hectares. The Forestry (Rebuilding the Forest Industry) Act 2014 requires the Minister for Resources to develop a special species management plan by October 2017. 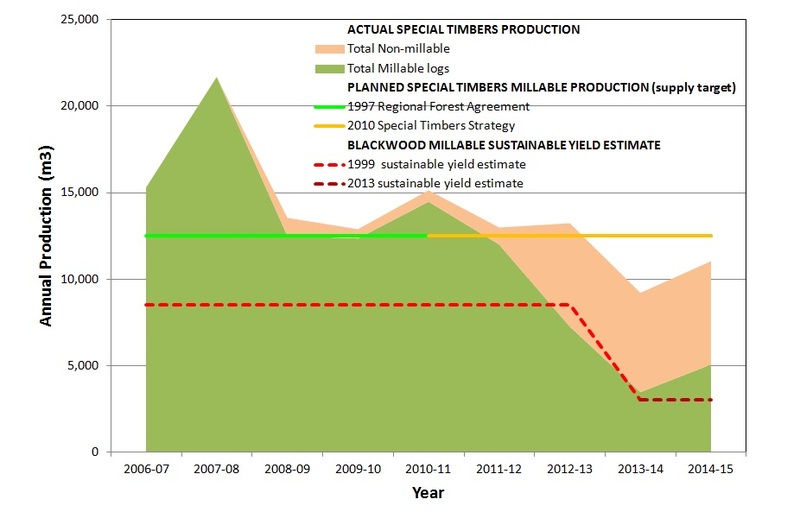 The final Plan indicates that Forestry Tasmania’s future management of special species timbers from PTPZ land will be informed by the special species management plan when it becomes available. So it’s going to take 3 years (!) to produce a plan that will tell us that the public native forest special timbers industry is over??!! Now let me guess! When is the next State election due? Oh that’s convenient! It’s just after the plan comes out. Stand by for yet another State election dominated by the forest industry! This is just too much! If it’s anything like the last Strategy in 2010 this plan will be a joke. The Plan has been updated to include the results of the December 2013 review of the sustainable level of harvesting from Forestry Tasmania’s blackwood management zone. This is true! It is now mentioned on page 32 of the Forest Management Plan (FMP). What is not discussed is why the ongoing harvest of blackwood from our public forests continues well above the sustainable yield at 10,000 cubic metres of sawlog per year. Is this blatant fraud or deception? Forestry Tasmania is obligated to make available a minimum of 137 000 cubic metres per year of high quality eucalypt sawlog and veneer log from Permanent Timber Production Zone land. In the process of harvesting this product, a range of other forest products are generated, including special species timbers. Forestry Tasmania has a range of systems in place to maximise the economic value, use and recovery of all forest products arising from harvesting operations. The Plan has been updated to include that in addition to supplying sawmill customers with special species timber, Forestry Tasmania maintains its commitment to its Island Specialty Timber business in order to stock and supply specialty timber products to meet market demand. This includes a tender system for higher quality products. I could really go to town on this one! Why do we have a legislated sawlog production volume but absolutely NO commercial performance objectives or criteria? It is the epitome of stupidity! And as for the “range of systems …. to maximise the economic value, use and recovery”. Clearly the systems have failed! Either that or the forest products produced by Forestry Tasmania are worthless! Either way the system clearly doesn’t work! Forestry Tasmania is presently conducting an inventory of the special species timber resource , using LiDAR imagery, as a consultancy for the State Government. What can I say? A futile exercise that will arrive just in time to dominate the next State election. I can’t wait! All of this for a “non commercial” activity! It really is a deeply offensive joke! In general, the harvest of special species timbers from the blackwood and eucalypt forest zones is a commercial activity while the harvest of special species timbers from the rainforest zone is a non-commercial activity and requires funding support (FMP, p. 32). So a “commercial activity” is defined as one that requires ongoing taxpayer support, whilst a “non-commercial activity” is defined as one that also requires ongoing taxpayer support. Appendix 1 of the FMP (Summary of recent legislative changes related to land previously managed by Forestry Tasmania) is also worth reading as it sets the stage for the next State election campaign, and further blood-letting around the special timbers industry. The stupidity around State forest policy and management is clearly set to continue for many years to come. Whilst FT appears to have made some minor progress is terms of transparency and stakeholder engagement, there is still a very long and difficult road ahead. All harvesting of wood from public native forest both inside and outside the Permanent Timber Production Zone must be on a profitable, commercial basis. Absolutely no taxpayer support for public native forest wood harvesting at all.